Cancer of the mouth is a very serious condition and everyone is at risk though smokers and heavy drinkers carry the greatest risks. Mouth cancer can occur very slowly and symptoms may go unnoticed or are thought to be unrelated to cancer.Many people suffer with mouth ulcers, especially when they are run down and most often these are harmless. If however, the ulcer doesn’t heal and is not painful, you may be at risk. Any red, white or discoloured areas of skin in the mouth can also be a sign so it is important to learn how your mouth looks and feels so you can spot any changes when they occur. Always visit your dentist regularly as they can assess the condition of your mouth and can also see areas that you will be unable to. Initially, if mouth cancer is suspected a small biopsy of the tissue will be taken and sent away to the laboratory for analysis. If cancer cells have been confirmed as present, you may need to have a full examination and a series of scans or x-rays to determine the extent of the cancer and if it has occurred in any other areas. It may be possible to remove the cancerous area, though a margin of healthy tissue will need to be taken as well to ensure that all the cells have been removed and this may necessitate the removal of parts of the neck, throat and jaw. It is vital that patients are fully counselled before the surgery and are aware that they may be left with permanent scarring and the chance of some disfigurement. Radiotherapy may be used during which a highly powered beam can be directed at the site of the cancer which will destroy the cancer cells this process usually requires the patient to attend several appointments to complete a series of radiotherapy. The second form of radiotherapy involves the insertion of radiotherapy ‘rods’ into the cancerous growth itself so it can work directly at the site. This may stay in situ for a week or more. Radiotherapy can affect the function of the salivary glands leaving the individual with a dry mouth and throat; this can be remedied using artificial salivary drops and by taking frequent sips of fluid. Chemotherapy may be used and may be given orally or via a vein. These drugs are very powerful and attack not only the cancer cells but may harm other cells too leaving the individual feeling quite ill in some cases. 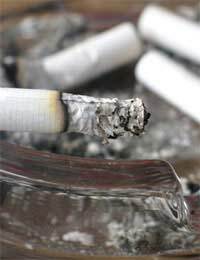 The single biggest way of reducing the risk of developing mouth cancer is to not smoke. The chances are hugely increased in smokers as the components that go into tobacco can easily cause cancer cells to develop. It is not just cigarette smokers who are at risk as the potential exists for those who smoke pipes, cigars, chew tobacco or use tobacco in other ways. Stop smoking now and you will decrease your risk straightway. There are many support groups and therapies around that can give you all the help you need to quit your habit. Almost as dangerous is drinking a lot of alcohol. By sticking to the recommended safe limits of alcohol per week your chances are reduced. Those in the highest risk category are those who drink and smoke, as the alcohol helps the chemicals in the tobacco to be absorbed into he tissues of the mouth. Many people who smoke and drink admit that they smoke more when they are having a drink, so the next time you go out, remember that your risks are the highest in any of the groups. There are other things that contribute to the chance of cancer of the mouth as prolonged exposure to the damaging rays of the sun can cause a form of cancer to develop around the mouth. Use a good sunscreen and protective lip slave when out in the sun and during the summer months. Mouth cancer is a very realistic risk in smokers and those who drink a lot of alcohol and can be treated with surgery, radiotherapy or chemotherapy with many people needing a combination of these forms of treatment.